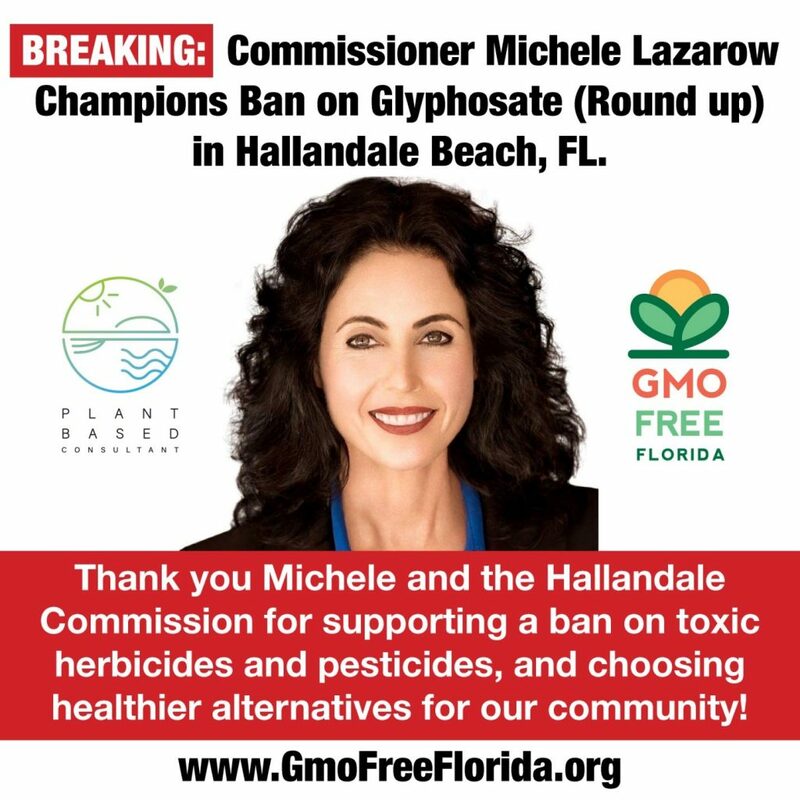 BREAKING: Michele Lazarow Hallandale Beach City Commissioner & the City of Hallandale Beach Government supports consumers right to ban harmful pesticides, herbicides –Glyphosate (Monsanto’s Roundup). Hallandale Bch, FL – Jan 9th, 2019 – The City of Hallandale Beach became the third city in Florida to unanimously pass a resolution in favor of banning pesticides and herbicides i.e., glyphosate (Monsanto roundup) utilizing non-toxic, viable alternatives. Consumers are asking for safer alternatives. Today we have a long list of scientific studies showing long-term risks to public health and the environment from the over usage of glyphosate. A special thanks to Plant Based Consultant for taking on this endeavor Bound by Beauty and Pesticide Free Miami for their resolutions in North Miami and Miami Beach. Glyphosate is the active chemical ingredient in Monsanto’s Roundup; a broad spectrum nutrient and mineral chelator; an endocrine and hormone disruptor; a patented antibiotic that is sprayed on GMO food crops; used as a ripening/drying agent on non-organic crops such as wheat, legumes, sugar, nuts, seeds; sprayed on lawns, sidewalks, children’s parks and schools; and is found in our waterways, rainwater, soil & air. Deemed by The W.H.O as a “Probable Human Carcinogen” and most recently, “Roundup causes Liver Disease in Low Doses” there are hundreds of studies that show harm from glyphosate. It is important to practice Precautionary Principle. There is no acceptable level of glyphosate in our bodies or the environment and for this reason we are calling for a moratorium on glyphosate in the State of Florida. Glyphosate is found in over 750 products and around 650 million tons have been used in 2013 alone. Glyphosate based herbicides are the most widely used in the world and their use has increased exponentially over the last 20 years (Benbrook 2016). Studies suggest glyphosate based herbicides at realistic doses may be an endocrine disruptor (Thongprakaisang 2013, Gasnier 2009) which may reduce testosterone levels (Clair 2012, Abarikwu 2015), impair sperm quality (Abarikwu 2015), or could cause disturbances in the reproductive development of experimental animals when the exposure was performed during puberty (Romano 2010) which may occur in humans as well. It is vitally important to recognize that children are far more susceptible to damage from environmental carcinogens and endocrine-disrupting compounds than adults. To the extent possible, parents and child care providers should choose foods, house and garden products, play spaces, toys, medicines, and medical tests that will minimize children’s exposure to toxics. Ideally, both women and men should avoid exposure to endocrine-disrupting chemicals and known or suspected carcinogens prior to a child’s conception and throughout pregnancy and early life, when risk of damage is greatest (The President’s Cancer Panel 2010). Other studies have reported kidney damage and liver damage including the potential for non-alcoholic fatty liver disease (Abarikwu 2015, Benedetti 2004, Séralini 2014, Mesnage 2015, Mesnage 2017) and observed intestine smooth muscle activity disturbances in experimental animals all at realistic doses. (Chłopecka 2014). Since glyphosate and its metabolites have been detected in air, rain, and water (Majewski 2007, Battaglin 2014), and may be sprayed in parks or schools where children will be exposed, it is virtually impossible to minimize children’s exposure to these toxins. Therefore, we call on legislators in Florida to take the precautionary principle to impose a moratorium on glyphosate based herbicides used in Florida to protect our children and prevent our people, pets, wildlife and endangered species from being exposed and our waterways and ecosystems from being contaminated. Glyphosate is a probable endocrine disruptor and probable human carcinogen that has already been banned in many Cities, Counties and Countries around the world. Glyphosate should be banned to reduce harmful cyanobacterial blooms and red tides. Glyphosate’s role in harmful cyanobacterial blooms and Red Tide. glyphosate inhibits the growth of other phytoplankton which would normally compete with Microcystis aeruginosa for nutrients. This further allows Microcystis aeruginosa to flourish in the presence of glyphosate. (Harris 2016) Florida Fish and Wildlife have repeatedly sprayed in and around Lake Okeechobee with glyphosate-based herbicides such as Roundup Custom, Rodeo and Aquaneat(Florida Fish and Wildlife 2015, Florida Fish and Wildlife 2016) Glyphosate can also find its way into water bodies even when not directly applied to water through runoff. (Majewski 2014, Battaglin 2014) Once Microcystis aeruginosa blooms occur this cyanobacteria can spread not only through connecting waterways, but also through an airborne route. (Lee 1989) This means that areas which are not connected by water to a source of Microcystis aeruginosa can still be contaminated even if it is miles away. Since Microcystis aeruginosa spreads through the air it could find its way into other water bodies. If these other water bodies have also been sprayed with glyphosate based herbicides it could also stimulate the growth of Microcystis aeruginosa which can cause blooms in these other water bodies. Trichodesmium is saltwater cyanobacteria found in the Gulf of Mexico and can sometimes be found in the Atlantic Ocean off the coast of Florida. Trichodesmium fixes nitrogen so it provides nutrients that increases the growth of Karenia brevis which is responsible for red tides. (Mulholland 2006) Like Microcystis aeruginosa, Trichodesmium also uses glyphosate as a source of phosphorus. (Dyhrman 2006) Therefore, the use of glyphosate by Trichodesmium can lead to saltwater cyanobacterial blooms which leads to an increase in nitrogen which then causes Karenia brevis blooms which leads to red tides. Harms from Microcystis and glyphosate. Microcystis aeruginosa produces cyanotoxins such as microcystins and BMAA . Exposure to these cyanotoxins may cause harmful effects such as non-alcoholic fatty liver disease(Albadrani 2017) and cancer. (Hernández 2009) Since toxins from Microcystis aeruginosa can be spread through the air and find their way into drinking water all people within several miles of a Microcystis aeruginosa bloom will likely be exposed to the cyanotoxins. Glyphosate exposure may also reduce testosterone levels (Clair 2012, Abarikwu 2015), impair sperm quality (Abarikwu 2015, Owagboriaye 2017), or cause disturbances in the reproductive development when exposed during puberty (Romano 2010). Along with an increase in glyphosate use there has been a 500% average increase in the level of glyphosate found in human urine. (Mills 2017) One study found higher urinary glyphosate levels in pregnant women was associated with a shortened gestational length which is associated with a reduction in lifetime cognitive achievement (Parvez 2018). Another study observed humans that were chronically ill had significantly higher glyphosate residues in their urine than their healthy counterparts (Kruger 2014). Environmental harms from Microcystis and glyphosate. Alternative methods to the use of glyphosate-based herbicides for reducing weeds in a water body depend on the conditions. If the weeds are above the surface of the water control could be accomplished with mechanical, biological, chemical and physical methods. Mechanical methods could include the use of small cutting boats. Although these cutting boats are initially expensive, in the long-term these boats are often more cost effective than glyphosate-based herbicides. Glyphosate based herbicides must be applied several times per month depending on the conditions. Over time this continuous use of glyphosate based herbicides leads to herbicide tolerant weeds meaning larger and larger doses must be used to kill weeds,and as previously mentioned this could increase the amount of harmful cyanobacteria in waterways. In comparison cutting boats function like lawnmowers where weeds never become immune to being cut and would not increase cyanobacteria. A local Florida company selling small cutting boats would be Weedoo Greenboat( https://www.weedooboats.com/ ). Less expensive weed cutters can be attached to already existing boats such as the Aquatic Mower( www.aquaticmowers.com ). Also, dock or frame-based weed cutters can be used such as the Lake Groomer( https://www.lakegroomer.net/ ). If the weeds are below the surface of the water, permanent control of weeds can be achieved with barriers. These function by blocking light to the plants, stopping photosynthesis, killing the weeds. These include examples such as LakeMat Pro( https://www.lakemat.com/lakemat-pro/ ) which float above the surface of the water, or Lake Bottom Blanket( http://lakebottomblanket.com ) which float above the benthos layer of the lake. This can provide permanent weed control for smaller water bodies. Stop using glyphosate-based herbicides and urge your neighbors, friends and relatives to do so as well. Contact your city council members and ask them to ban or severely restrict glyphosate use on city-owned properties. This can be done by adopting a resolution similar to North Miami. (North Miami 2018) Contact local stores that sell glyphosate-based herbicides such as Lowes and Home Depot and urge them to stop selling it. Buy organic food which does not allow glyphosate to be used.